Does Khodorkovsky want to return to politics? For the first time since his release from prison, Mikhail Khodorkovsky expressed an intention to get back into Russia’s political melee. On Sept. 20, former Yukos C.E.O. Mikhail Khodorkovsky announced the re-launch of his Open Russia project. When Khodorkovsky was freed from prison on Dec. 20, 2013 after more than 10 years behind bars, he announced that he intended to focus on promoting human rights; many observers consider the relaunch of Open Russia the first step in this plan, albeit one with a more overt political agenda. Mikhail Khodorkovsky, once Russia’s richest man as the founder and C.E.O. of the Yukos oil company, was convicted on charges of embezzlement on May 31, 2005 and sentenced to nine years in prison. 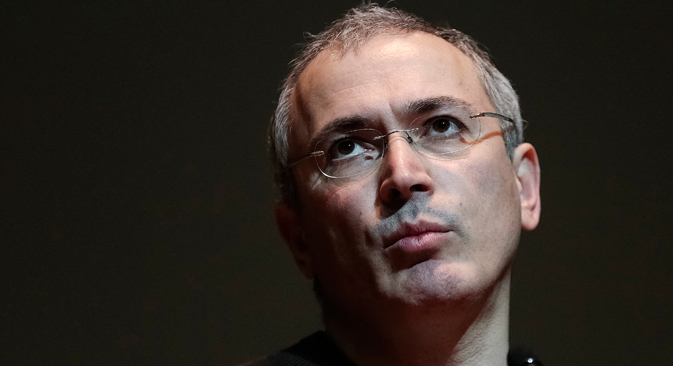 In late 2010, a court again sentenced Khodorkovsky to 14 years in prison on charges of stealing 200,000,000 tons of oil and money laundering. After serving 10 years in prison, much of it in a labor camp in Chita, Khodorkovsky was granted amnesty on Dec. 20, 2013. Open Russia, which was founded by Yukos shareholders and other private individuals in 2001, developed charitable and educational projects throughout Russia. By the time Khodorkovsky was convicted of embezzlement in 2005, Open Russia was operating branches in 50 Russian regions. The new Open Russia will have a different focus. "We share what is called 'European values' and do not agree with the political system that declares these value illegitimate," Khodorkovsky told the French newspaper Le Monde. "In order to resist efficiently, what we need is not another 'vertical' party fighting for power, but a 'horizontal' alliance of many 'small social groups' that would unite and act together." Khodorkovsky wants Open Russia to spearhead this alliance. According to Alexei Mukhin, general director of the think tank Political Information Center, Open Russia’s success depends on its funding. "It seems that Mikhail Khodorkovsky is planning on spending his personal resources on, what he says, is the creation of a civil society," Mukhin said. "But taking into consideration the Russian reality, this money will not last long. It will be necessary to attract funds from elsewhere, from émigré-oligarchs for example, or from other countries." Open Russia, in Khodorkovsky's words, does not intend to participate in elections as an independent political force or a political party, but will provide support to "dignified" candidates. "The resistance's main objective is the elections to all levels, but first and foremost, of course, elections to the State Duma in 2016," Khodorkovsky said. Valery Solovei, a professor at the Moscow State Institute of International Relations (MGIMO) thinks that Open Russia will face more than just financial challenges. "There will be administrative and political pressure," Solovei said. He added that at the moment, both Khodorkovsky and liberal politics have an image problem in Russia. "Currently, his reputation in the eyes of the Russian population and in the eyes of the liberal movement is far from positive," Solovei said. According to a 2013 survey from the Levada Center polling agency, only two percent of respondents would support a Khodorkovsky presidential candidacy. It is unclear, however, whether Khodorkovsky harbors political ambitions for himself. In the interview with Le Monde, he said that he had no desire to be president if Russia "is developing normally." However, he said that he would be “willing to accept part of the effort” to implement constitutional reforms with the aim of redistributing authority among the judiciary, the legislature and civil society. Russian newspaper Vedomosti interpreted these comments as a sign that Khodorkovsky did indeed intend to run for president, but Khodorkovsky responded to the claim with a more enigmatic remark: "When this government leads the country into a crisis, which will not take long, perhaps a few years, and if people will want to change the governmental system to a more modern one, at that stage I will be ready to carry out the work," Khodorkovsky said. Russian Presidential Spokesman Dmitri Peskov told radio station Kommersant FM that there was no reason for the Kremlin to comment on Khodorkovsky’s annoucement. "I would say that Khodorkovsky is now trying to get a feel of the terrain," said Solovei. "He needs to understand what the dominating moods are in the liberal camp, a part of which, by the way, is not enthusiastic about his intentions." Solovei believes that Khodorkovsky is trying to understand how much of the political elite would support an alternative to Vladimir Putin. "This is not even reconnaissance before battle, it is reconnaissance of distant frontiers," Solovei said. Mukhin said that Khodorkovsky will not be able to keep himself from running for president, despite previous statements. "Khodorkovsky is stepping on the same rakes he was stepping on before. He had said many times that he would not busy himself with politics, but in the end he succumbed to circumstances,” Mukhin said. Regardless of his intentions, Khodorkovsky does not have any way to advance any presidential ambitions in the near future. In February, a new law was passed prohibiting those convicted of serious crimes from running for office for 10 years after their convictions are annulled. Under this law, Khodorkovsky will have to wait another eight years before launching a presidential campaign.